Status: Contest finished on 30-12-2009. New remix contest by Silent Shore Records. The trance label run a competition to choose the best two remixes of the track “Come With Me To Varanasi” from ReOrder & JayCan. Win a digital release, 100€ and a label contract! Silent Shore Records and Discover Trance Radio give you a chance to stand aside of the “big trance world”. 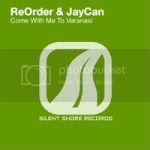 Become one of the best by remixing one of the latest upcoming releases of Silent Shore Records: ReOrder & JayCan – Come With Me To Varanasi. We call out a Remix Competition. The 2 producers have chance to win and their remixes will be take part of the Release on Silent Shore Exclusive and best one gets 100 eur and will bacome our artist!